Tor Bookings, new shows update! Here’s an update on two Tor Bookings gigs we have coming up in Todmorden. MXLX has unfortunately had to pull out of playing the show we have booked on the 13th October. 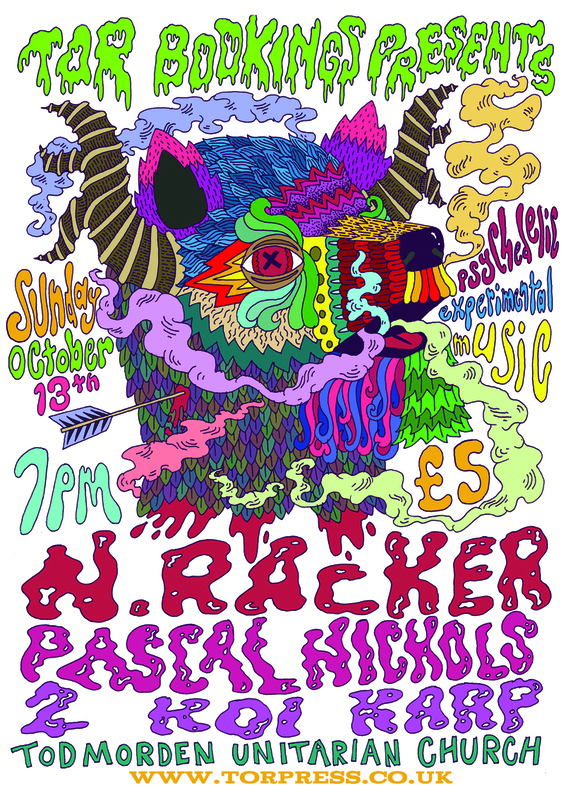 But, the show must go on and in an exciting twist, our friends the incredible, N.RACKER, will be headlining this show. I saw N.Racker play at Bradford’s Recon Festival last weekend and they were one of my favourites of the whole event and I’m so happy they are able to perform at the church. N.Racker work as an in-sync duo collaboratively producing an eerie sound even John Carpenter would be creeped out by. Long, droning dark synth tones from homemade instruments, strings and fractured vocals make for an unique experience. The live show is so impressively PRO, I wouldn’t miss seeing them if I were you. Oh and they are local to Todmorden. 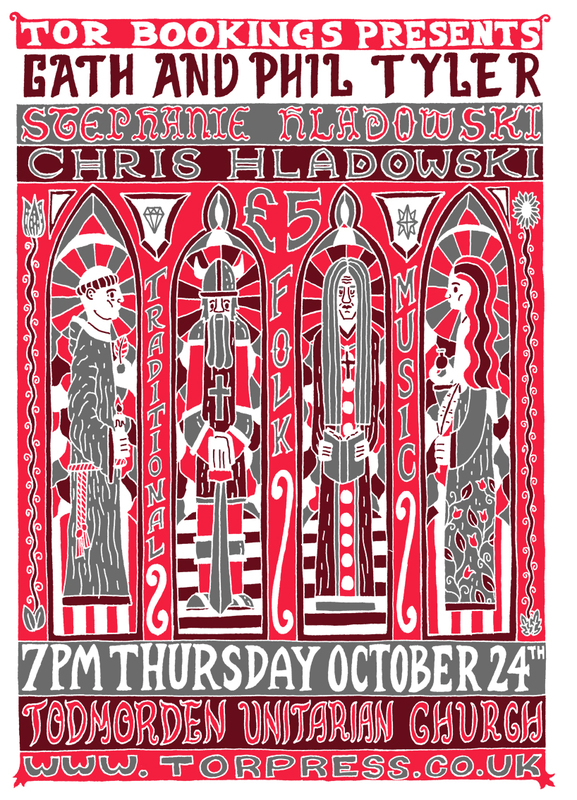 Then just 10 short days after on the 24th October we have another great night featuring Cath and Phil Tyler, Chris Hladowski and Stephaine Hladowski. Cath & Phil Tyler play Anglo-American folk music using guitar, banjo, voice and fiddle. Cath was a member of the band Cordelia’s Dad in the 1990s when she lived in Massachusetts, USA. Phil, from Newcastle upon Tyne has played in various folk, rock and ceilidh bands for many years. Coming together musically through a shared love of traditional narrative song, full voiced sacred harp singing and sparse mountain banjo, they have performed on stages as diverse as the Royal Opera House in London and a dank tower in the old city walls of Newcastle. Taking a more minimal approach to their material than some, they have been described as ‘one of the most compelling musical partnerships on the scene’, their music being ‘a highly concentrated and intimate musical experience that penetrates to the very rawest essence of folk tradition’. Stephanie is a vocalist known for her take on traditional folk singing. Her style often reminiscent of the 60’s folk revival. Her music is raw, emotive and deeply affecting. Both her EP on Singing Knives Records and her recent collaboration with C Joynes have been met with critical acclaim. Chris is best known for his band and chief project The Family Elan. A truly talented and effortless Bouzouki and Saz player, most of his music is inspired by the traditional songs of Eastern Europe and the middle east. Amongst other projects he’s played in A Hawk And A Hacksaw, Nalle and The One Ensemble as well as collaborating with musicians from Southern Asia and Pakistan. Hope to see you at one or both of these shows!